Oliver Twist is notable for Dickens' unromantic portrayal of criminals and their sordid lives. The book exposed the cruel treatment of many a waif-child in London, which increased international concern in what is sometimes known as "The Great London Waif Crisis": the large number of orphans in London in the Dickens era. An early example of the social novel, the book calls the public's attention to various contemporary evils, including the Poor Law, child labour and the recruitment of children as criminals. Dickens mocks the hypocrisies of his time by surrounding the novel's serious themes with sarcasm and dark humour. A waif (from the Old French guaif, stray beast) is a living creature removed, by hardship, loss or other helpless circumstance, from his or her original surroundings. The most common usage of the word is to designate a homeless, forsaken or orphaned child, or someone whose appearance is evocative of the same.As such, the term is similar to a ragamuffin or street urchin, although the main distinction is volitional: a runaway youth might live on the streets, but would not properly be called a waif as the departure from one's home was an exercise of free will. Likewise, a person fleeing their home for purposes of safety (as in response to political oppression or natural disaster), is typically considered not a waif but a refugee. Orphanages After the Poor Law Amendment Act of 1934, also known as the New Poor Law, orphanages and children’s homes were created for those who could not care for themselves. Boys were generally taught a trade and girls were prepared to enter domestic service. However, some of these institutions were so awful that children actually opted to pursue a criminal lifestyle on the street than to suffer in an orphanage. Criminals/Other Occupations Orphans would were not adopted nor entered an institution often became criminals. Indeed, an estimated 60% of the criminal population were orphans, at one point or another. They indulged in thievery or became prostitutes to survive.The more honest orphans who lived on the streets often banded together for survival, doing menial tasks for the upper class, or begging for money. London in the eighteenth century was a swirling mass of contrasts. A rowdy hedonistic, gin-swilling public rubbed shoulders with gentlefolk keen to do good work. One of the worst problems affected by the social conditions in London in the early eighteenth century was the large numbers of children either entirely abandoned or thrown on the tender mercies of the parish - illegitimate children were handed over to parish officers for a lump sum. But London was late in providing welfare for these children in comparison with many other European cities They often worked long hours in dangerous jobs and in difficult situations for a very little wage. At an early age the children would be out looking for work or roaming the streets looking for odd jobs. Some would be stealing for food. Pickpockets were in abundance and even a stolen handkerchief or scarf could be sold for food.The best way for society to deal with the poor was to ignore them. They were 'burdens on the public'. Although Poor Laws were put into place, it wasn't until after the Victorian age ended that 'the lower class' was able, through education, technology, and reform, to raise itself (in some cases literally) out of the gutter. Victorian society could be quite pleasant, but only depending on your financial status. From an Article by "Tudor Rose" By Edwardian times, old attitudes about the 'deserving poor' were beginning to change. 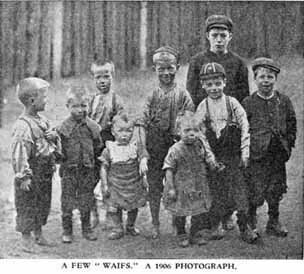 The work of organizations like the Waifs and Strays' Society alerted people to the problems of destitute children, whose poverty was through no fault of their own. Between its foundation in 1881 and the end of World War One, the Waifs and Strays' Society cared for around 22,500 children. The Society opened its first children's home at Dulwich in 1882, and by 1918 it had run nearly 175 homes all around England and Wales. Some of these homes were only open for a few years, while others operated for decades. They varied from small cottage homes in rural locations to homes in the big cities of London, Leeds, Birmingham and Liverpool. Industrial homes, like Standon Farm Home, would teach children a trade, so that they could support themselves in later life. Children with disabilities were integrated in homes, but the Society also had specialist centres that could specifically care for their needs. All ages of children were cared for by the Society - while some homes cared for the youngest babies, others like Clapham Home Of Rest For Girls Out Of Situation, provided shelter for those between 15 and 21. Ragged and ill-fitting clothes were all some children had to wear. In the past, numerous children were orphaned. In societies where people married early and had many children, and a high death rate was common in the adult population, many children lost one of their parents, and some both, before coming of age. Orphans suffered from a higher death rate than other children did. They often had to live outside of standard households, either because they were placed in a foster family or, as was more often the case, because they were placed as servants or apprentices at an earlier age than was common. Charitable societies first, then towns or nations, organized to improve these children's living conditions and to make it easier for them to become integrated into society.Street children is a term used to refer to children who live on the streets of a city. They are basically deprived of family care and protection. Most children on the streets are between the ages of about 5 and 17 years old, and their population between different cities is varied. Street children live in abandoned buildings, cardboard boxes, parks or on the street itself. A great deal has been written defining street children, but the primary difficulty is that there are no precise categories, but rather a continuum, ranging from children who spend some time in the streets and sleep in a house with ill-prepared adults, to those who live entirely in the streets and have no adult supervision or care. Picking pockets without a person's knowledge and approval is a crime, a form of larceny which involves the stealing of money and valuables from the person of a victim without their noticing the theft at the time. It requires considerable dexterity and a knack for misdirection. Someone who picks pockets is known as a pickpocket. Famous fictional pickpockets include The Artful Dodger and Fagin, characters from the Charles Dickens novel Oliver Twist. Famous true-life pickpockets include the Irish-American prostitute Chicago May, who was profiled in the books Chicago May, Queen of the Blackmailers and Hell Hath No Fury: Famous Women in Crime. Pickpocket skills are also used by magicians, either to take an item from a spectator or to return it without their knowledge. James Freedman (magician) a.k.a 'The Man of Steal' created the pickpocket sequences for Oliver Twist (2005 film) directed by Roman Polanski. Time Out magazine wrote that James Freedman is "possibly the world's best pickpocket". Professional illusionist David Avadon featured pickpocketing as his trademark act for more than 30 years and promoted himself as "a daring pickpocket with dashing finesse" and "the country's premier exhibition pickpocket, one of the few masters in the world of this underground art. Jacob's Island was immortalized by Charles Dickens's novel Oliver Twist, in which the principal villain Bill Sikes meets a nasty end in the mud of 'Folly Ditch'. Dickens provides a vivid description of what it was like:"... crazy wooden galleries common to the backs of half a dozen houses, with holes from which to look upon the slime beneath; windows, broken and patched, with poles thrust out, on which to dry the linen that is never there; rooms so small, so filthy, so confined, that the air would seem to be too tainted even for the dirt and squalor which they shelter; wooden chambers thrusting themselves out above the mud and threatening to fall into it - as some have done; dirt-besmeared walls and decaying foundations, every repulsive lineament of poverty, every loathsome indication of filth, rot, and garbage: all these ornament the banks of Jacob's Island. "Dickens was taken to this then-impoverished and unsavory location by the officers of the river police, with whom he would occasionally go on patrol. When a local politician attempted to deny the very existence of Jacob's Island, Dickens gave him short shrift, describing the area as "the filthiest, the strangest, the most extraordinary of the many localities that are hidden in London". The area was once notoriously squalid and described as "The very capital of cholera" and "The Venice of drains" by the Morning Chronicle of 1849. The ditches were filled in the early 1850s, and the area later redeveloped as warehouses. Jacob's Island was extensively bombed during the Second World War and today only one Victorian warehouse survives. Over the past twenty years the Island area has undergone considerable regeneration and gentrification.